This post features the latest news about music education. You can also visit our other pages on resources, campaigns and opinion articles. These pages are updated each time we add news about music in schools. It focuses mainly on the UK currently. The number of music teachers working in Scottish primary schools has fallen by more than 40 per cent over the past seven years. Campaigners fear that Ceredigion will slice provision in the county and impact generations to come. Subject is in a ‘perilous state’ and is being squeezed out of the curriculum by competing demands, says new research. Report on live music industry says quality of music education in England faces multiple threats. Council leader denies a threat to its schools music service amid claims it faces a budget cut of two-thirds. Institutionalised racism continues to affect the live sector, committee told. The move follows a 2017 pilot project that found arts and heritage crowdfunding donations increased by 17% when the project was match-funded. They called for politicians to address the 100,000 children missing out on music lessons in Scotland because of cost. The report of the 18-month enquiry by the Music Commission says that music education must evolve to fit the needs of the 21st century or risk failing generations of young talent. Scotland’s ‘incredibly rich’ music culture needs protection amid fears over cuts. People power won the day when controversial plans to axe music tuition were dropped after a huge protest outside a Scottish council. Music teaching’s an easy target and first for the chop when budgets are squeezed. We investigate a misguided approach that will have catastrophic consequences for our culture. The All-Party Parliamentary Group for Music Education, the University of Sussex, and the Incorporated Society of Musicians (ISM) have released a report which looks at the effect of the English Baccalaureate (EBacc) on music education. Midlothian Council is set to become the first Scottish local authority to cut music tuition in schools. This is good news for arts subjects in England which have been squeezed out of the curriculum due to a combination of the current accountability measures and funding. A new research report by Youth Music of young people aged 7 to 17 in England, shows that music is essential to their lives, significantly improving their wellbeing. Two DJ’s have launched the initiative to try and protect music teaching in schools in Scotland. Consultation begins on new curriculum being designed by teachers in Wales. Councillor George Smith said ‘ideally we’d not like to have any charges at all’. The Westminster government has come under fire for choosing just three serving school leaders for its 14-strong panel that will develop its new “model” music curriculum for England. Schools Minister Nick Gibb announces plans for new curriculum in England alongside a £1.33m injection of funding for music hubs. Rising tuition fees for pupils interested in learning music have led to an increase in those dropping out of classes. The economic output from the cultural sector is now just under £30bn, having grown by 7.3% in one year. A senior Westminster Government Minister has for the first time pointed to the controversial EBacc education policy as one of the causes of a decline in music in English schools. The report makes a series of recommendations for both music education in the classroom and any revised National Plan for Music Education in England. Schools in England should need to demonstrate excellence in creative and technical subjects to be rated ‘outstanding’, says report. Two Scottish Youth Parliament members give evidence to Holyrood’s education committee as part of its inquiry into music tuition in schools. The Welsh Government has also been advised to establish national pop and rock competitions, and significantly increase funding for musical instruments. DfE to write to universities after failure to list A-level music as facilitating subject branded ‘profoundly unhelpful’. Campaigners against the EBacc have welcomed the move, but say it will not be enough on its own to save arts subjects. The number of pupils in Wales studying music at A-level has halved in 10 years while GCSE entries have seen a 40% drop. The number of children receiving musical instrument tuition in Scotland’s schools has dropped by more than 1,200 over the past year. Fewer schools in England offering subject at A-level and fewer pupils taking it at GCSE. Since 2013, the number of A-level entries in arts subjects in England, which include drama, music and art, has fallen by 14,000, almost 15%. While, entries in Stem subjects – science, technology, engineering and maths – have increased by 15,500, 6%. Latest figures for 2017 show that the time spent teaching music is down 11% at KS3, and 12% at KS4. 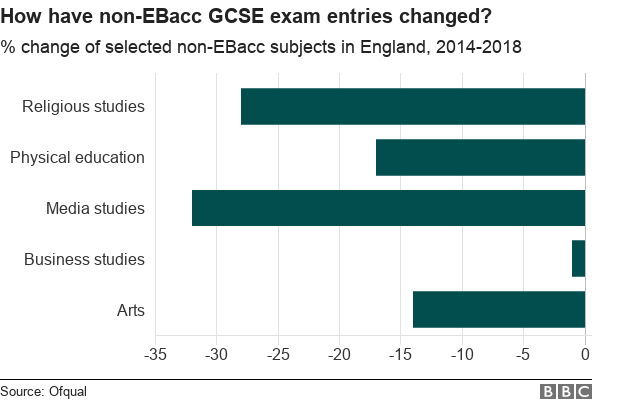 The sharp warning from the Association of School and College Leaders comes as A-level data in England reveals the decline in entries for arts subjects has doubled in speed since last year. Warning that the decline of music in schools could jeopardise the UK’s multi-billion-pound music industry. The drop in those aged 14 to 18 was revealed in a report on English music education hubs by Birmingham City University. New report shows more than 700,000 pupils in England are benefiting from whole class instrumental teaching. The story that broke about music teacher Jimmy Rotheram, head Naveed Idrees and Feversham Primary’s journey from special measures to being in the top 10% nationally. It features four of the UK’s main access-to-music organisations – Creative United, OHMI, Drake Music and OpenUp Music – who want to make musical instruments more widely available to aspiring young musicians – particularly to disabled people.